Something we are most likely reminded of in the warmer months, hydration is best considered all year round. The daily recommendation is two litres of water, which equates to about eight glasses. This can literally be a bit hard to swallow, especially if conditioned to more flavoursome drinks such as tea, coffee, juice or soft drink. Plain water just lacks the panache of other liquids. Tea and coffee offer a pick me up, fresh juice is tasty and more filling and soft drinks have enticing colours with a sugar hit. The downside of course is that caffeine is also a diuretic, so tea and coffee will have you passing more fluid. Freshly squeezed juice that includes the pulp is best, but anything bought pre packaged is sure to have plenty of sugar, just like the fancy soft drink. With excess sugar in the blood, the kidneys work overtime, producing more urine to eliminate these sweet indulgences. This is where plain water has the chance to shine. When looking for healthy hydration choices, water is the best option for the body’s needs. This is mainly due to its simplicity, as the absence of sugar elevates extra calories, contributions to tooth decay and any adverse effects excessive amounts would have on the body. Also it doesn’t need to be the bottled variety, as Melbourne has some of the highest quality drinking water in the world. Any concerns though can be covered with a home filtering system, with some manufacturers providing the option to also filter out fluoride. Tap water is the most practical option for hydration as it is readily available and inexpensive. As its is the easiest to access, water can always be at arms reach, and by doing so can be a great reminder to stay hydrated. So to compete with these exotic looking and flavoursome options, it is worth investing in a colourful water bottle or fancy jug and glass. After all presentation counts and this may in turn develop a new found respect, worthy of such a quality resource. For hydration during exercise, most look to the option of a sports drink. There is evidence that hypotonic drinks such as some brands of ‘sports water’ provide faster fluid absorption than other sports drinks, assuming that you are an elite athlete and have a desperate need for immediate hydration. But for the rest of us it is good to pause before you discard water as an option and familiarise yourself with the sugar levels of sports drinks. When compared to other drinks that are available, it is interesting to note that sports drinks have more than half the sugar of soft drinks. However there are sports drinks currently available that contains no sugar or calories, but it has been argued that the ingredients used to create the flavour cause more harm than sugar. Not to worry, there are plenty of alternatives out there to make your own awesome sports tonic. The main things to consider are ingredients that can provide the carbohydrates and electrolytes normally found in sports drinks. Most often added as glucose, carbohydrates supply the muscles with fuel during exercise, whilst sodium, the main electrolyte used, replenishes this element lost through sweat during exercise. Sodium helps assist with fluid replacement, preventing dehydration from occurring and it also improves the drive to drink. The flavoured derived from sugar and salt increases the palatability of a sports drink and consequently helps encourage fluid consumption. So the same science used to create off the shelf sports drinks, can be applied to make a home made sports drink that is healthy and palatable. First a base of a litre of plain liquid such as tap water or coconut water is needed. Next a quarter of a teaspoon of quality, unrefined sea salt will provide sodium. Finally add some fresh fruit juice such as a quarter of a cup of lemon and a cup of orange juice for some sweetness. This can be further enhanced by adding minerals such as a teaspoon of calcium magnesium powder. If you wish to keep to the naturally packaged alternative, then nuts, such as almonds and cashews, are a great source of calcium and magnesium. They also contain potassium and phosphate, to complete the common minerals that provide electrolytes in sports drinks. Replacing these electrolytes that are used during exercise, is essential for the contraction of muscles, in other words to prevent cramping. Even if you are not exercising it is good to have alternatives to plain water as a source of healthy hydration. With the ingredients above, it is easy to swap water for watermelon or add some cucumber. Natural sugar like raw honey or maple syrup can be used as a sweetener. Ginger or lime can add a bit of zing. Replacing these drinks with even more complex ingredients such as milk, bananas, celery, avocado, and kale can provide a range of minerals and nutrients to help fulfil your recommended daily intake. As the body is made up of at least two thirds water, hydration plays an integral part in the normal functioning of the body, providing assistance to joint lubrication, proper digestion and eliminating toxins from the body. Without enough hydration, subtle effects of headaches or muscle cramps can lead to more severe symptoms of fever, confusion and unconsciousness. Breathing, heart rate and blood pressure can all be effected, with infants being the most vulnerable to dehydration. Once dehydrated it is important to replenish these liquids to restore the balance between salts and sugar in the body. 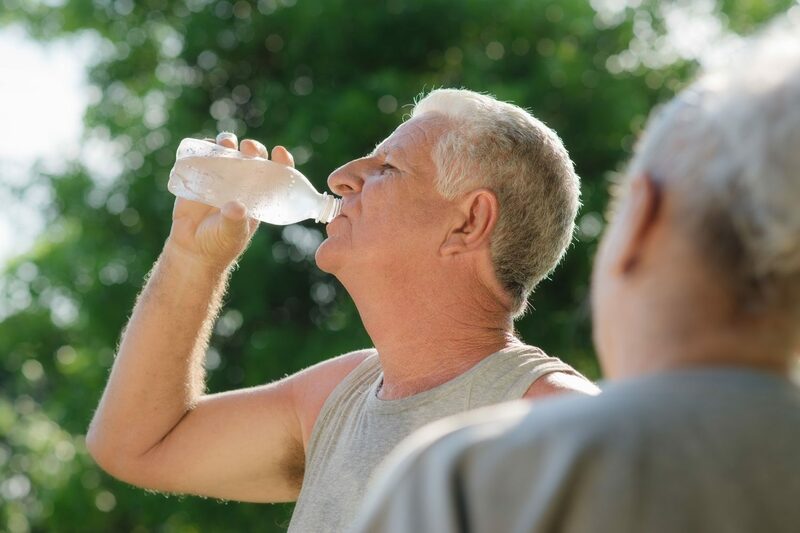 If not possible to rehydrate due to sickness then help should be sought by a doctor immediately, especially in the case of the old, elderly or those with underlying health concerns. With this in mind, it is easy to see the incentive for carrying a home made sports drink and accommodating a jug of water on the desk at work or bench at home. You never know, a slice of citrus for some colour and tang, could grow to adding a water based smoothie to the start of the day. Either way, the simplest, cheapest, healthiest and most accessible option for hydration, will hopefully always be water.